Contrary to their common name, crabeater seals, Lobodon carcinophagus (Hombron & Jacquinot, 1842), (often mispelled Lobodon carcinophaga), do not live up to their name, they do not feed primarily on crabs. These fascinating seals measure 2.2-2.6 m in length and weigh 200-300 kg. Males and females are generally close in size with females typically slightly heavier. After the molting season, the back fur of the crabeater seal is dark brown fading to blond on its belly. These seals also have dark brown markings along the back and sides. Their flippers are very dark brown. The fur lightens throughout the year becoming completely blond in summer just before molting. Crabeaters have a long snout and slender body. Crabeater seals, Lobodon carcinophagus, inhabit the Southern Ocean and surrounding islands as well as South America, Australia, South Africa, Tasmania, and New Zealand in winter. Because they live in remote, harsh environments, the exact population size of this species is unknown. Original estimates place the population at approximately 15 million, however it is now thought that the population is much smaller. Crabeater seals migrate seasonally according to the movement of the pack ice. Crabeater seals are typically solitary animals, however they are also known to gather into aggregations of about 1,000 animals. They dive to feed on krill at night. They are known to dive for long periods of time up to 16 hours for feeding, traveling or migrating, and exploring. The dives range between 10 m for traveling dives, 30 m for food, and slightly deeper for exploratory dives. 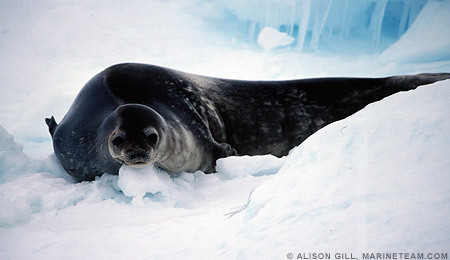 Crabeater seals have been known to use breathing holes in the ice created by Weddell seals, Leptonychotes weddellii and in some cases may chase juvenile Weddell seals away from their breathing holes. At the end of the summer when the ice begins to freeze, crabeater seals begin to travel north. Some crabeaters have been known to become disoriented traveling south on the pack ice instead of north hundreds of kilometers inland. These are mostly juveniles and they usually die as a result of their misdirection. Those that travel north are bound for the islands of Oceania, Australia, South America, and even South Africa. They are a highly mobile and fast pinniped that can travel up to 25 kph. When crabeater seals travel at this speed, they lift and swing their head from side to side moving their foreflippers across the ice to navigate with their hind flippers elevated behind them to avoid drag. Crabeater seals have distinctive and complex teeth. Each tooth has tubercles, or bony protuberances, with spaces between them. The upper and lower jaws fit together so that when mouth is closed, the teeth and tubercles can strain krill. As mentioned previously, krill, such as Euphausia superba, not crabs, are the primary food source for crabeater seals. They feed by swimming through schools of krill with their mouth open, sieving the water out using their sophisticated teeth. When they migrate outside the Antarctic, crabeater seals are thought to feed on other invertebrates as well as small fishes. They feed primarily at night, typically all night long, hauling out on the ice to rest during the day. Crabeater seals are preyed on by orca (killer whales) and leopard seals. 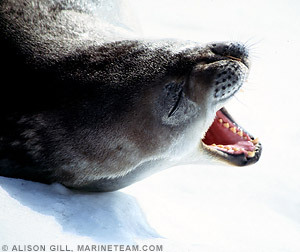 To deflect an attack, the crabeater seal will bare its teeth and snort or hiss when approached. They also tend to roll over to avoid being tackled by their predators. Crabeater seals are thought to reproduce in Antarctica on the pack ice during the early Spring months between October and December. Unlike other seal species, crabeaters tend to mate on the ice rather than in the water. In September, following an 11-month gestation period, females give birth to a single pup on an ice floe. Pups are born about 1.2 m in length and weigh between 20-30 kg and gain weight while nursing at a rate of about 4.2 kg/day. The mother and her pup stay in close contact for the duration of the nursing period, which lasts about 3 weeks. A male crabeater seal, usually not the father, will join the female just before or just after she gives birth to protect the mother and her pup. Soon after weaning, females are ready to breed again, and, although her protective male defends her from the aggression of other males, he is typically aggressive toward the female during the nursing period. Crabeater seals reach sexual maturity between 3 and 4 years of age. Females have successful pregnancies when they are between 5 and 25 years old. The crabeater seal, Lobodon carcinophagus, is one of the most abundant pinniped species. Its remote habitat reduces the threats to this species, and are only at risk from environmental pollution (trace amounts of DDT have been found in this species) and the potential for overfishing of krill, the crabeater’s primary prey. Some krill-fishing nations are seeking an increase in krill quotas in Antarctica. The krill fishery has been on the rise since the mid-1990s and new techniques have been developed that process krill for fish feed. Another potential threat to crabeaters is global warming, which is impacting ocean ecosystems sooner and more seriously than originally anticipated. This trend could potentially decrease pack ice, which will decrease the habitat of crabeaters and other species. In addition, krill may suffer in warmed waters, which would reduce the food supply for this and many other marine species. Crabeater seals are not commonly hunted commercially because of their remote habitat. In addition, all seal hunting in the Antarctic region is regulated by the Antarctic Treaty and the Convention for the Conservation of Antarctic Seals (CCAS). The habitat of the crabeater seal is protected by such legislation as the January 1998 Environmental Protection Protocol to the Antarctic Treaty, which bans mining and oil drilling in Antarctica for at least 50 years. The treaty also bans refuse disposal and the use of pesticides in the region. It is thought that crabeaters are abundant because of the near-extinction of large baleen whales, which also feed on krill. The decrease in the number of baleen whales has increased the availability of krill. Some scientists also attribute the reduction in the age of sexual maturity of crabeater seals to the increase in its primary prey. Photos by Marine Team – a network of professionals working in the marine environment who are dedicated to the conservation of marine species and their habitat.